Fr. Bader, Abu Ghazaleh discuss issuance of media ethics charter. 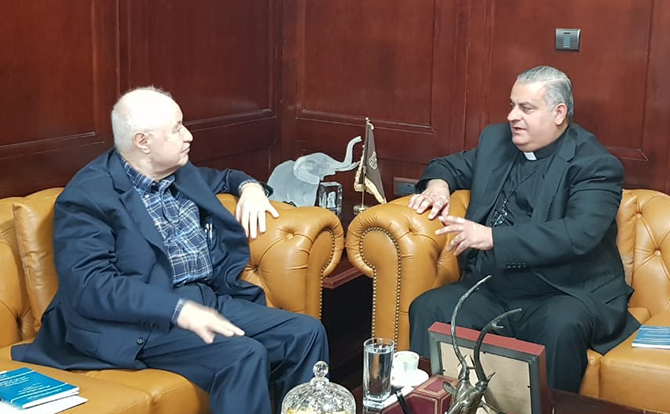 Dr. Talal Abu Ghazaleh has received Director of the Catholic Center for Studies and Media (CCSM) in Jordan Fr. Dr. Rif’at Bader. The discussion focused on the final stages of drafting a comprehensive media ethics charter based on the principles of the Islamic and the Christian religions. Dr. Abu Ghazaleh pointed out that this idea is based on the model established by His Majesty King Abdullah II who has exerted extensive effort to maintain religious coexistence within the Islamic religion on the one hand and between Islam and other religions on the other, where such efforts surpassed those exerted by any other political leaders which entitled him to be awarded the 2108 Templeton Prize. For his part, Father Bader expressed his optimism that this charter will become a guide for all. He added that the work done by the Talal Abu Ghazaleh Forum on the Humanitarian Charter constitutes an excellent idea that benefits all societies and aims at bringing about the changes aspired to spread love and peace, instead of hatred and conflict, which is based on the meeting that had taken place between Dr. Abu Ghazaleh and His Holiness Pope Francis at the Vatican. It is noteworthy that a committee will be formed comprising experts, media institutions and journalists, in addition to clergymen in order to draft the charter. The committee will organize seminars and meetings aimed at raising awareness and shedding light on the charter.